We Happy Few is a confusing game at first glance. It’s got the trappings, grand scale, and look of a AAA title. But dig a little deeper, and it’s really an indie title masquerading as one of the “big boys”. 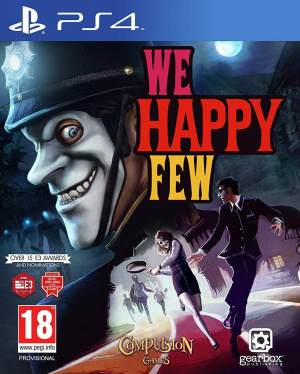 Given that just about everyone in the game wears a mask, this is a rather enjoyable double entendre, but the real question is ultimately whether developer Compulsion Games – one of the studios Microsoft announced it had acquired at this year’s E3 conference – was able to make us happy with its game. And the answer to that is: it’s complicated. Compulsion’s first title, Contrast, launched alongside the PS4, and along with the amazing Resogun, marked the first PlayStation Plus titles of the generation. While it was ultimately a massive let-down, there were redeeming qualities to it. It was an uneven, buggy game that nevertheless had some redeeming qualities, and that by-and-large describes We Happy Few as well. 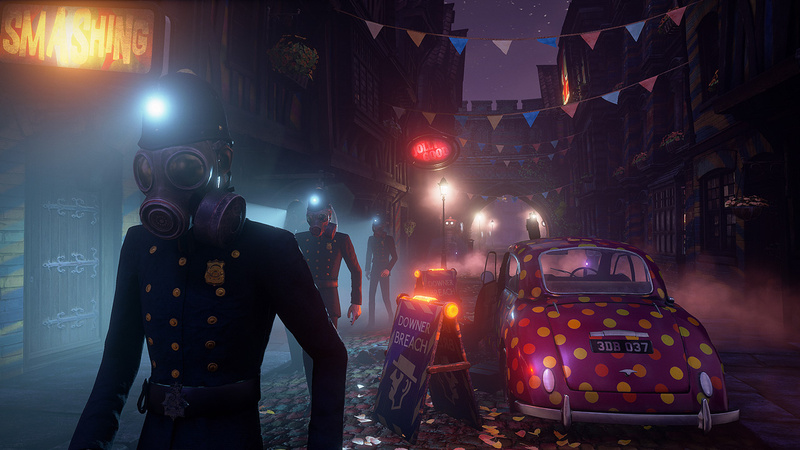 We Happy Few is an open world game that takes place in a dystopian 1964 England in a world where the Nazis won World War 2. Everyone who’s still hanging around is forced to take a drug called Joy that keeps people constantly happy and unable to dwell on their past or any negative thoughts in general. It completely alters your perception of the world around you. The contrast between the brightly coloured, 70’s world of Joy and the rundown bleak world that you see when off your meds – people who don’t take their Joy are referred to as downers – is fantastic. Really, the hook of the whole game is fantastic. The dystopian world and the ideas presented are incredible and the environment of Wellington Wells is engaging to explore. For a time. The quirks of the gameplay start building and making the game feel more tedious. Resource harvesting and crafting are pervasive throughout the entire experience. Survival elements are a source of near constant irritation as well, although you do have a say in how important drinking and eating is to the game. If you set survival elements to low, it offers an opportunity to get a stat buff, but you can just flat-out ignore it if you want. Much like the downers in the game who stop taking their Joy, the cracks in the world start to leak through and things begin to look bleaker. 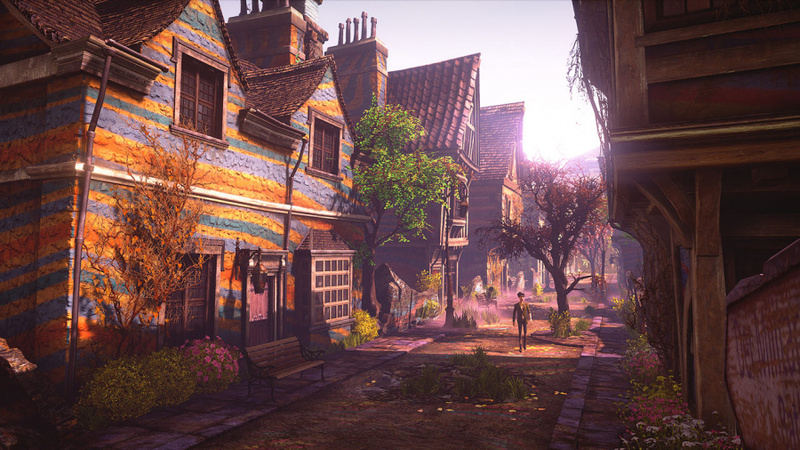 The game’s AAA scale is largely due in part to the procedural generation that Compulsion utilises to increase the scale of the game, which for the most part works. But that’s really all it does. It works. It certainly doesn’t improve the game. 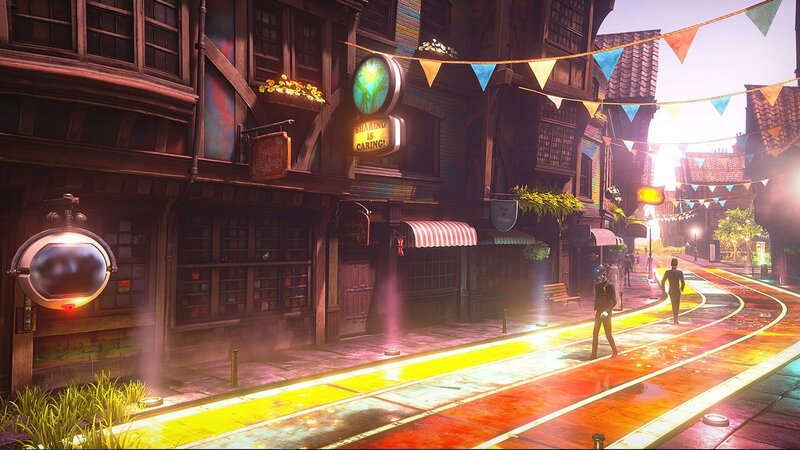 In fact, the game’s best moments are all the more tightly scripted aspects as it allows for the story elements to be more elaborate and for the environments themselves to be more guided. When you’re doing the disappointingly sparse number of more heavily scripted moments, the game plays and feels almost exactly like an open world Bethesda title. Which sounds like a compliment, but it picks up largely the negative aspects: uninteresting, if mostly serviceable combat, with peaks and valleys of enjoyment, lots of recycled and bland assets, and woeful technical performance. The thing is, the game is a technological mess. We hit several game breaking bugs which were thankfully saved by the title’s mostly generous checkpoint system, and an innumerable number of other bugs that don’t really hamper the experience but really irritate. The most egregious of the performance problems however is the framerate. The game runs at a largely unstable 30 frames-per-second, but it dips heavily in moments of intense action. And it seems to be a compounding problem, as the longer the play-session is the more frequent and severe the frame dips get. And it's a full $60 title, even though only one of its two “included” modes is functional. Sandbox mode, which allows you to more elaborately customise the environment you’ll drop into, is a more of a roguelike game mode and was heavily featured throughout the title’s lengthy run as an early access title. The other mode is story mode, which features three campaigns as you play as three different citizens of the Wellington Wells. The first campaign you play as a man named Arthur. This is where the first misstep of the story mode occurs. You don’t get to play each campaign independently from one another, which we think would work much better. The first campaign, which already ran us about 15 hours, felt like it was stretching things out a little too much, which immediately led into the second campaign, where you play Sally, and then after Sally, Ollie. Doing them one after the other felt extremely tiring and by the time we got to Ollie, or honestly even Sally, we really didn’t want to play anymore. The biggest reason for this is that what feels like a two hour story is strung out over a dozen. The problems are especially egregious during Arthur’s playthrough, as his narrative is threadbare, and wildly uninteresting. The fact that Arthur’s true motivations are “the twist” at the end of the narrative hurts many different aspects of the title. Without the full picture of why Arthur is doing what he’s doing, many of the situations he flies into blindly are a bit too extreme. If there were so much as a hint that there was a deeper reason behind him doing what he’s doing, the narrative might not have felt so scattershot. On the bright side, Sally is a vastly more interesting character, and is the real standout of the title. A chemist and mother who crafts black-market Joy, you actually first encounter her in Arthur’s campaign. In the two brief times you meet up she manages to be more interesting than the entirety of Arthur’s narrative, too. However, one really cool aspect of the title – this applies for Ollie as well – is that whenever you encounter a player character in each respective campaign they play out differently than the first time you saw the events. This pairs well with the nature of Joy, and how perceptions can differ from person to person. Frankly, it’ one of the coolest things in the entire game. Each character does mercifully play wildly different from one another, with different physical limitations, run speeds, personalities, and even skill trees. Some abilities overlap, but they are for the most part unique to each of the characters. This ability to easily distinguish one character from the other is useful for justifying why each gets their own campaign, but we are still flummoxed as to why you can’t pick who to start with, or play them all individually. 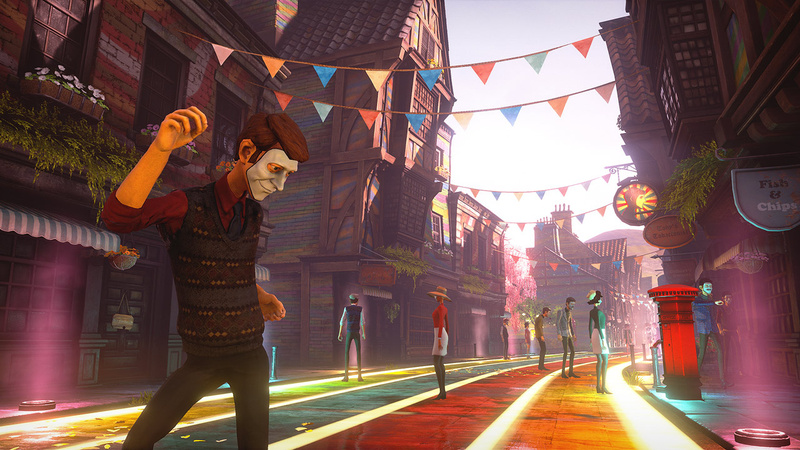 We Happy Few isn’t bad per se, but it’s a very near miss, as the game comes right up to the brink of collapsing in upon itself due to its many missteps. It offers such an intriguing backdrop for its world, and really interesting art, that whenever it's more focused and non-procedural, it’s a grand old time. These spikes of enjoyment are however far too infrequent given the scale and running time of the title, often times leaving you floundering amid strong art direction and music without any real desire to actually play. Somewhere I read this described as a "great art style looking for a good game". Sounds accurate and it's a shame. Damn, this had so much promise. I really wish I didn't have to say this, but perhaps it'll be fixed up with the numerous patches it's bound to receive. It's a bit sad that so many games are shipped 'broken' and so reliant on patches to fix things up nowadays. It just makes it feel like the whole industry is based on selling incomplete or 'alpha' software to the gaming masses. Sadly this is pretty much exactly what I expected. I am still interested in this, but I not at as full-price game. If it’s ever available with Game Pass or Games with Gold (sorry Push Square), I will look into it. Seems like this is Compulsion Games all over, great concept but very poor execution. @NintendoFan4Lyf I think there is a good chance it would be available on Game Pass at least soon, if not already. Compulsion is a MS first-party studio now so I think that would be a given. That said, there would also be very little to no chance this would ever come to PS Plus IGC, as I think there is no way Sony would be paying MS to have this available to 80m+ PS Plus subscribers for 'free'. @Turismo4GT Yeah, you are probably right. I did check Game Pass to see if it was already available and it’s not. Sadly, I probably will never pay for PS+, again, so Xbox is my shot at playing this for “free”. It’s nothing against PS+, just smart economics: I get 2 years of Xbox Live Gold for $50 and I can get 6 months of Game Pass for $30. I was able to play this game before release, and enjoyed the little bit I played. Though it sounds like that...uhm...joy...disappears after a while. I did have high hopes for the game because I liked the dystopian aesthetic to it all. Such a pity, it looks like it could have been a real winner. @Neolit I always appreciate a Big L reference. I shall not be purchasing this. I hope they patch the bugs it looks like such an interesting game with a good story. Seems like they completely and hopelessly overstretched themselves. If they didn't have the capability to make the sort of "AAA style" game they wanted I'm not sure why they bothered. Sounds like another dev couldn't hack it into hollywood, who went down the gaming route, without implementing the game part. @Turismo4GT It's definitely got the potential for that. Could be a real No Man's Sky situation! @adf86 Yep! I was thinkin' that multiple times while playing! Couldn't help but think of Contrast! @mookysam @AFCC 100% the game screamed "overreach" ! This is getting pretty slaughtered as a buggy mess. Sounds like it needed another year in the oven. This is a shame because it's such a great concept. It kind of feels like too many people got hold of this and started chucking their ideas in. Most games have storylines that could easily be told in a 2-hour experience: Bloodborne, Dark Souls, the Long Dark, Monster Hunter World, Far Cry 5, just to name a few. Games that have elobrate and lengthy storylines and narratives are the exception rather than the rule, in my opinion. Games like Uncharted, Detroit, the Last of Us, Divinity Original Sin and so on. I think the mistake they did with Happy Few was to have a "typical" AAA-like narrative. The game is more fitting as a sandbox survival game in my opinion, that's what they should have focused 100% on. I feel the same way with the Long Dark. @Bonbonetti Monster Hunter World is something that has a story in it. The same goes for Bloodborne and co. But they both have great gameplay and run great. Heck even Monster Hunter World has new free content all the time which is complemented with a nice intro. But the best about these games is that they are fun and solid games with great gameplay to boot. I think this game should have been redone completely. It should have had some different gameplay choices like choosing what character you play with. And i dont understand that these games get through quality control at a price of €60. With a seasonpass to add insult to injury. @Flaming_Kaiser I still disagree with the whole storyline issue, but agree when it comes to the technical aspects. For a $60 game it should not have the problems it has. Although other games have gotten a decent scores despite having similar issues, Kingdome Come Deliverance for example, as noted by PushSquare themselves (http://www.pushsquare.com/news/2018/02/kingdom_come_launch_issues_noted_should_be_patched_in_approximately_2_weeks) , who still gave it a 7/10 score. To me 'technical issues' are category worse than having a weak storyline and similar. @Bonbonetti I feel 100% opposite to that haha. I think the sandbox stuff was the last thing they should have focused on, especially with an indie-sized production. 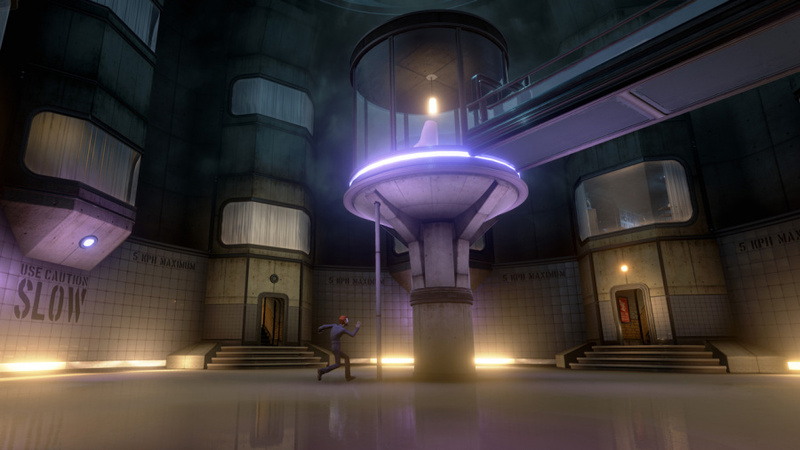 As it stands, Compulsion crafted an intriguing and fascinating world, and then just kinda let it hang there, doing nothing with it. The emphasis on crafting and survival elements took massive amounts of attention away from the intriguing stories they could've crafted if the game were condensed a bit. Not to say it needed to have a grand, sprawling narrative. But rather, the way it happened with this game, is they essentially dangled intriguing narrative ideas like a carrot, and then just tossed the carrot in the garbage rather than feed it to the player. @Flaming_Kaiser True, updating the game with a season pass is a little more noble I guess, but hopefully the end goal is ultimately the same! @Bonbonetti I don't know that I'd definitively say technical issues trump writing when it comes to detractors. I'd say it varies from game to game. I can think of a few examples of really poorly optimized games that I love because of the narrative depsite the fact they're a technical disaster. Deadly Premonition being the first that comes to mind. But in a more general sense, I'd say I agree. Technical woes are much worse. It actively hampers the ability to play the game after all. Sadly I'm not all that surprised but it's still a shame. Here's hoping the price will drop big time by next year. @AFCC It's possible but I'm inclined to think it was trending this way anyways. The game was giving off these types of vibes when it was still early access, and well before MSoft had announced they had bought Compulsion. But it's certainly possible! @AFCC Yeah it's definitely possible. The game feels like a bit of an overreach at every turn I was hoping for better too!